There are a total of 59 national parks in the United States and each was created for a different purpose. 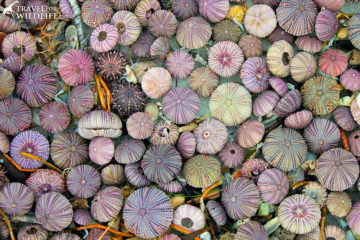 They protect natural beauty, unique geological features, archaeological sites, or unusual ecosystems. 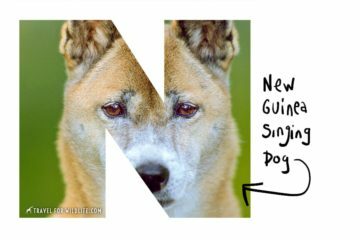 But not every national park is created equal when it comes to wildlife watching. 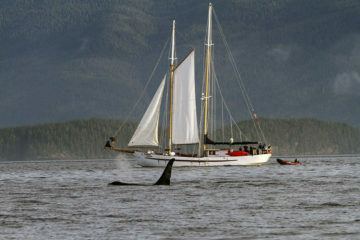 For example, the Kenai Fjords National Park in Alaska protects the Harding Icefield and at least 38 glaciers and fjords stemming from it, the Congaree National Park in South Carolina takes its pride in being home to the largest old-growth floodplain forest left in North America, and Mesa Verde National Park in Colorado is famous for having over 4,000 archaeological sites of the Ancestral Puebloan people. A visit to any of these National Parks will be memorable, but won’t necessarily include an abundance of wildlife sightings. However, there are a few national parks in the United States where visitors can see a wide array of North America’s iconic animals in the wild. In our opinion, these are the best national parks for wildlife watching in the United States. Yellowstone is without a doubt the most famous national park in the world. This is where herds of bison graze in the valleys, grizzly bears amble across mountain slopes, and the grey wolf howls into the night. Yellowstone visitors come to the park for a myriad of reasons. To witness bubbling mud volcanoes or Old Faithful shooting high in the air, to fish clear trout streams, or to hike and backpack in a vast wilderness. 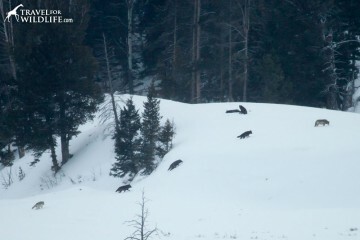 But a large percentage of park visitors are just hoping to catch a glimpse of Yellowstone’s most famous wildlife residents: the wolves. That’s because Yellowstone is undoubtedly the best place to see grey wolves in the US. 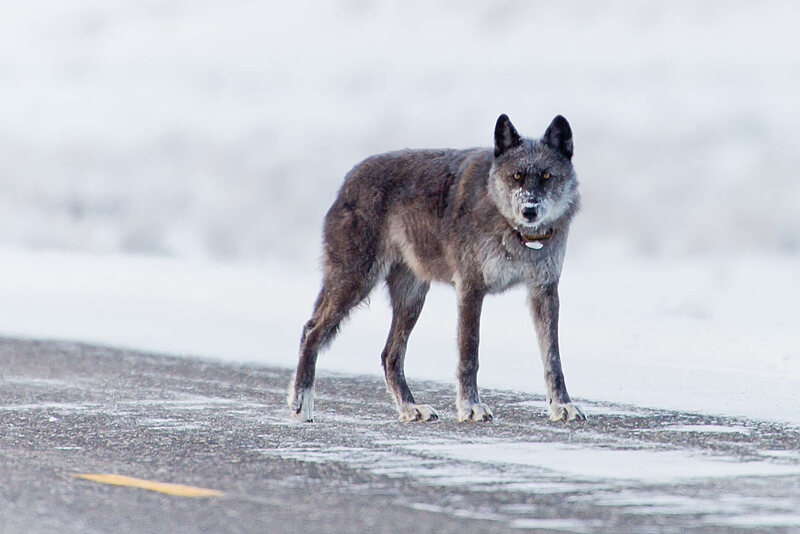 A black wolf crosses the road in Yellowstone National Park. Yellowstone is especially good for watching mammals as the park has the highest diversity of large mammals in the lower 48 states. Add to that the fact that more than 300 species of birds have been documented in the park, and you have one of the best destinations in the world to see wildlife. Definitely one of the best national parks in the US to see wildlife. 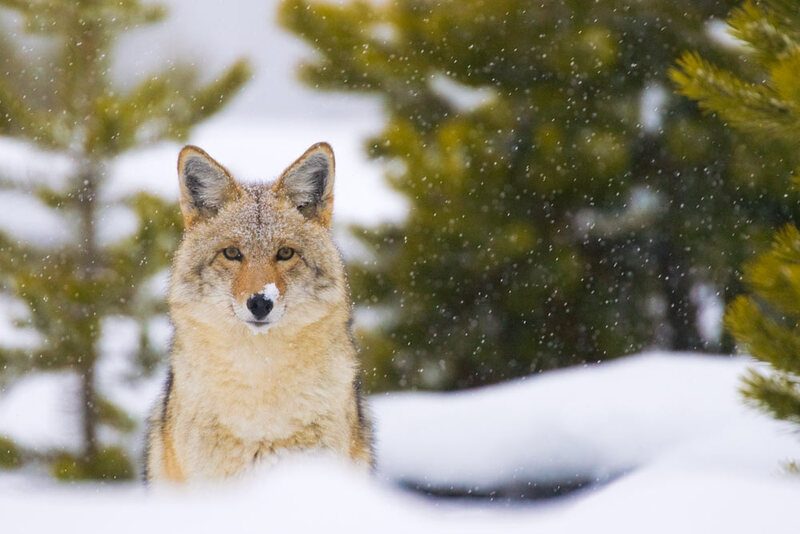 Aside from the grey wolf, Yellowstone is also home to many other iconic American wildlife species like the bison, pronghorn, mountain lion, grizzly bear, black bear, elk, coyote, wolverine, and bobcats. 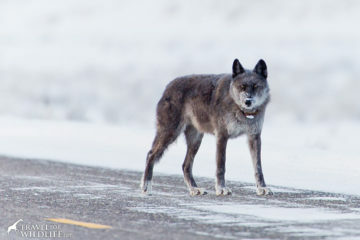 Other wildlife that you’ll have a chance to see in the Yellowstone ecosystem are Canada lynx, pine marten, white-tailed deer, moose, mule deer, river otter, bald eagle, red tailed hawk, ermine, mountain goats, bighorn sheep, red squirrel, Trumpeter swans, sandhill cranes, loons, peregrine falcons, Great horned owl, and Great grey owls. 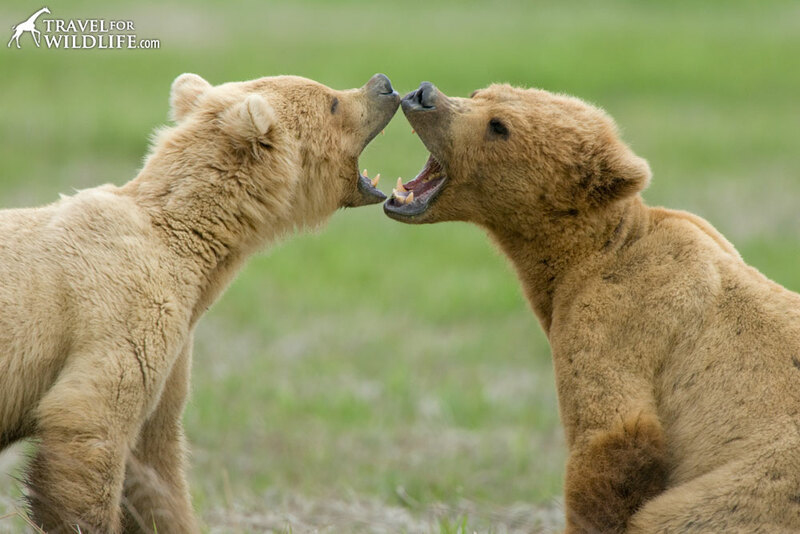 Yellowstone National Park is one of the last strongholds of the Grizzly Bear in the lower 48 states of the US. While you can see wildlife anywhere in the park, the Lamar Valley in the northeast is famous for its wildlife watching opportunities. It is here where you’ll have a real chance to see a wolf hunting. Yellowstone is such an amazing place that almost every season is incredible in the park. I would only avoid summer as it is the busiest time in the park. 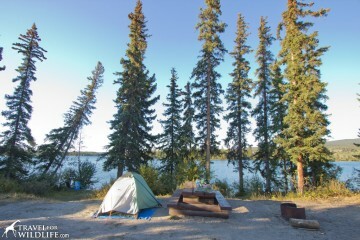 But if you do visit during summer, get away from the crowds by going backcountry camping. 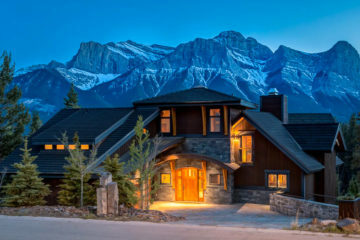 If you are not ready to rough it you can also stay at one of the cozy Yellowstone cabin rentals. 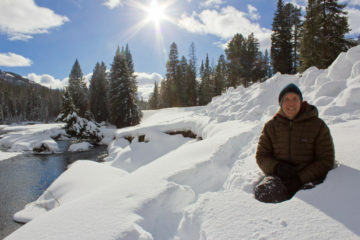 For us, winter is the best time to visit Yellowstone as wildlife is very visible against the white snow and the visitor numbers are very low. Warning: temperatures can drop to around -25F during this period, so if you do visit the park in winter, make sure to wear proper winter gear for Yellowstone. 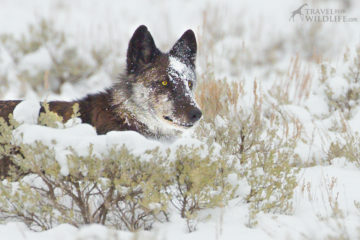 Winter is a great time for canid watching, including wolves, red foxes, and the inquisitive coyote (shown here). If you visit during spring, you’ll be at the peak of baby season. If you are interested in autumn colors and the elk and bison rut then fall is your season! The Everglades are the largest tropical wilderness in the US. The mangroves, the tropical rain forest ecosystem, and the marine estuary shelter 36 protected species such as the American crocodile, the Florida panther, and the West Indian manatee. 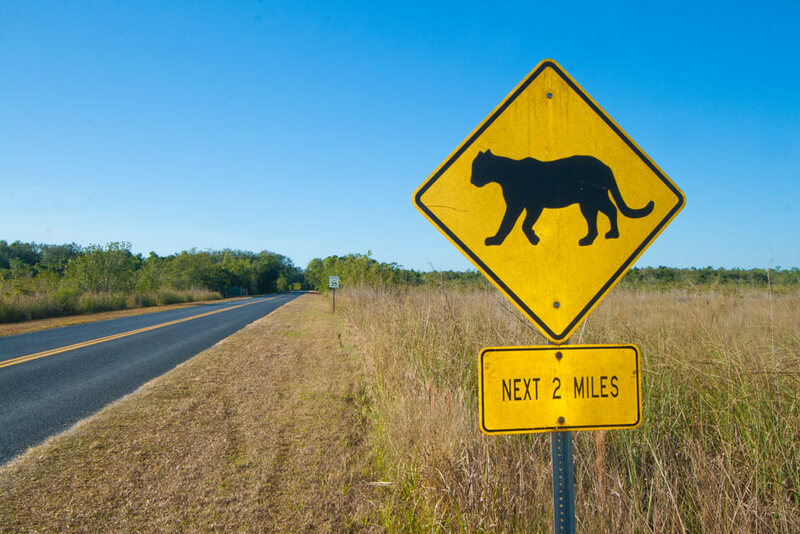 Keep your eyes peeled for the endangered Florida Panther in the Everglades! The most popular place to visit in the Everglades is perhaps the Anhinga Trail. This short and accessible trail is only 0.8 miles, but wildlife abounds here. The Anhinga trail is one of the main destination for birders that visit the Everglades as, aside from the many Alligators that are found along the trail, you can see black vultures, anhingas, nesting egrets, herons, cormorants, and roseate spoonbills at close range, and many other water birds. 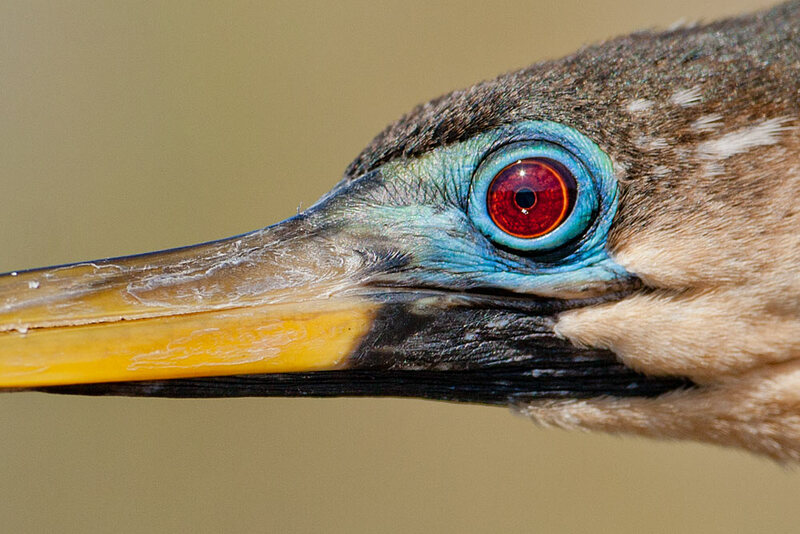 Get up close and personal with anhingas on the Anhinga Trail in the Everglades. 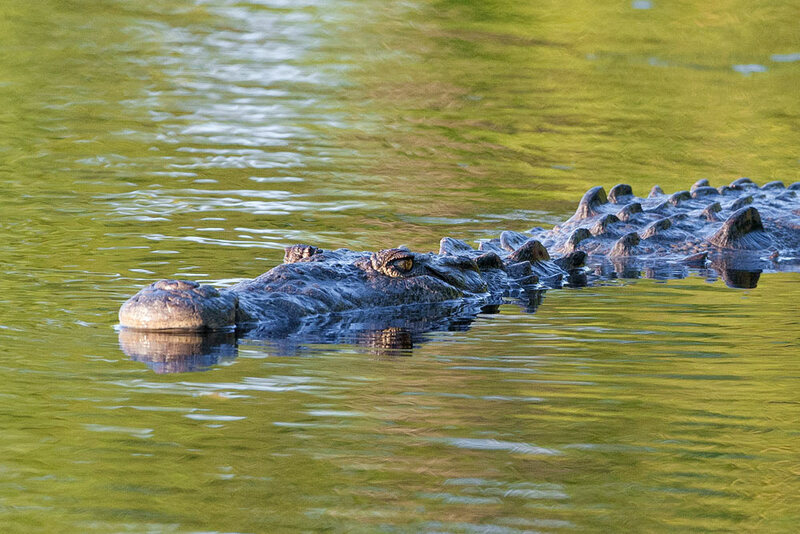 The best place to see the American Crocodile is right around the Flamingo Visitor Center where you might also spot a manatee coming to the surface to breathe. American Crocodile swimming near the Flamingo Visitors Center in Everglades National Park. The Everglades is also a good place to kayak with alligators as there are a few put-ins around the park and alligators are almost everywhere. The more adventurous can paddle the 99-mile long Wilderness Waterway, a canoe trail that follows the west coastline of the park. Here you have opportunities to spot alligators, manatees, and dolphins. Let’s face it. It’s hot and humid in the Everglades and there are tons of mosquitoes during the hottest summer months in Florida. 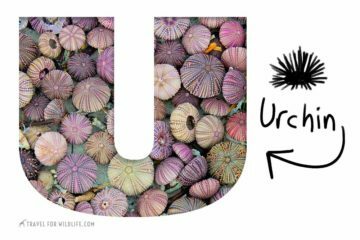 Avoid the discomforts of heat and mosquitoes by planning your trip for the winter months. With over 10 million visitors in 2016, the Great Smoky Mountains National Park is the most visited national park in the US. However it is still possible to visit the Smokies (as locals call this national park) without the crowds. 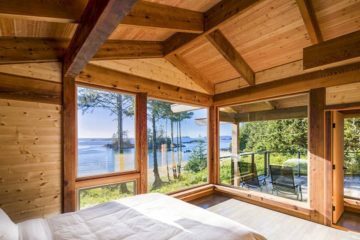 You can go camping in the Smokies or stay at a cute mountain cabin for a more intimate Smokies experience. Black bears live in high densities in the Smoky Mountains National Park. There are two wildlife hot spot areas in the Smoky Mountains. CADES COVE: on the western side of the park, is home to black bears, white tailed deer, turkeys, coyote, river otters, bobcats, foxes, owls, and other Appalachian wildlife. The Cades Cove loop is a scenic drive that winds for 11 miles through this lush mountain habitat that will deliver many wildlife sightings. You can also visit the restored historic buildings including a working water mill. CATALOOCHEE, on the eastern side of the park, is home to a herd of elk. 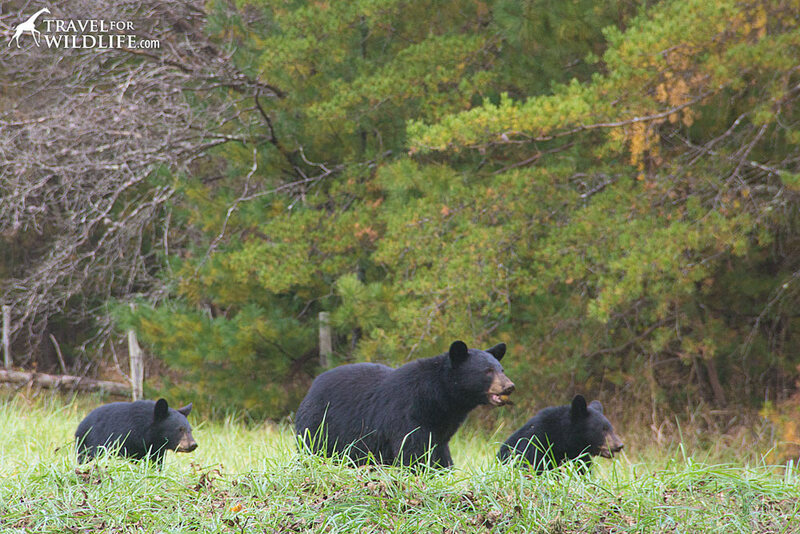 Black bears and wild turkey are also sighted regularly in Cataloochee. 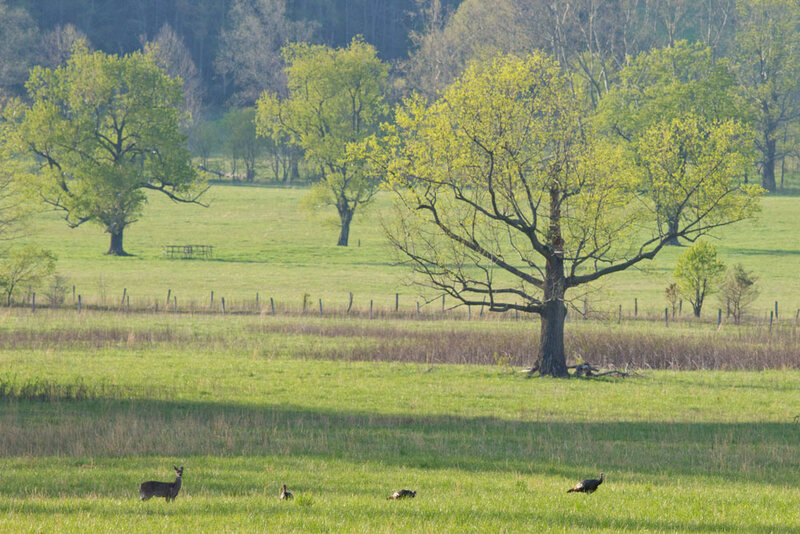 White-tailed deer and wild turkeys are a common sight in Cades Cove. The Great Smoky Mountains National Park is world famous for its spring wild flowers. Slightly less well known is that the Smokies are referred to as the “Salamander Capital of the World” with more than 30 different species, many of which migrate during spring. Autumn is one of the most popular times of year to visit (also knows as leaf season) thanks to the incredible fall colors in the forest. 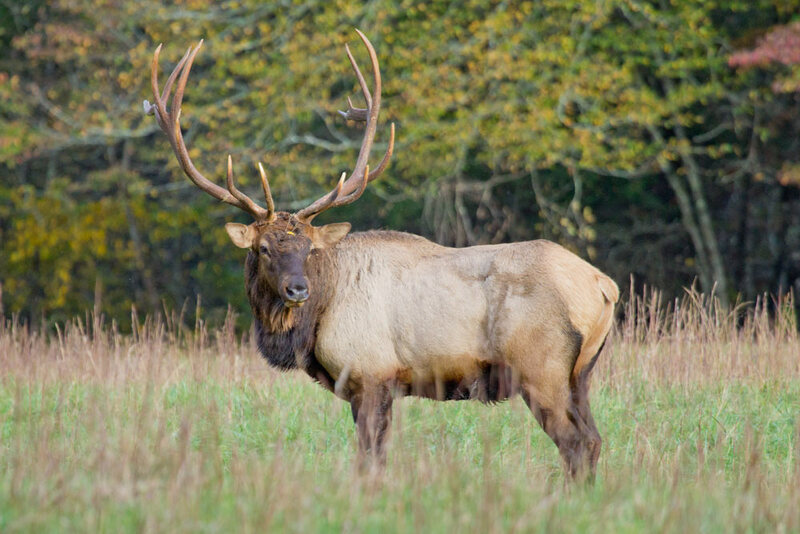 During fall you can also witness the elk rut in Cataloochee, as well black bears coming down to the forest edges to feed on fruits and nuts while they fatten up for winter hibernation. Listening to the Elk bugling in the fall is one of the great wildlife experiences of the Smokies. Another wildlife spectacle in the Great Smoky Mountains is the synchronous fireflies. 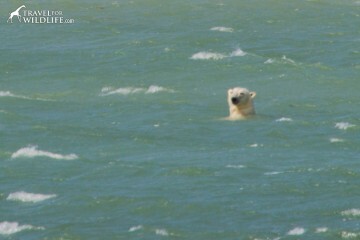 To watch this natural show you must visit the national park in June. Check out the National Park Service website for more information about the synchronous fireflies. Black bears, elk rut, synchronous fireflies, wild flowers…all of these make the Smokies one of the best national parks in the United States to visit. 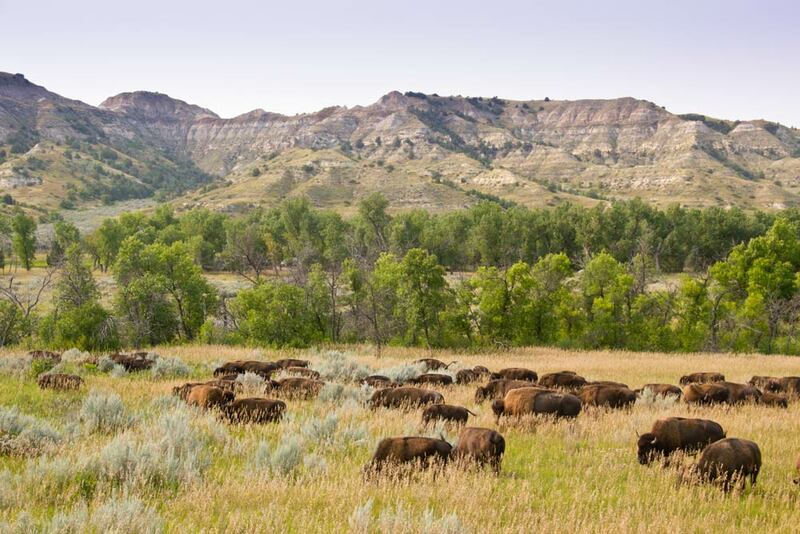 Theodore Roosevelt National Park was established in 1978 in honor of the US president. What makes this place special is that it is one of the few national parks that feature and protect American prairie habitats and wildlife. Watching the prairie dog towns in Theodore Roosevelt National Park, North Dakota. The park is comprised of three separate units: the north section, the south section, and the Elkhorn Ranch in between. Even though the Little Missouri river flows through all three and they are connected by the Maah Daah Hey Trail, the three units are pretty far apart. The northern and southern sections of the park are about one and half hours drive apart. 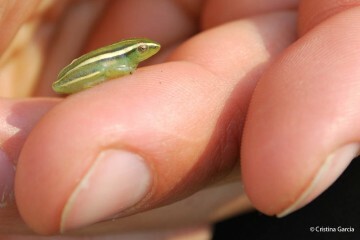 The south unit is the richest with wildlife. 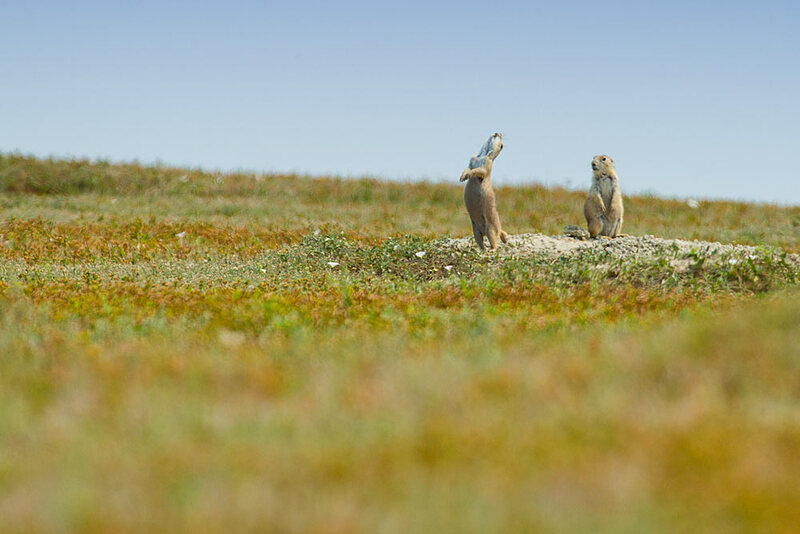 The many different habitats support a wide variety of mammals like bison, bands of feral horses, mule deer, pronghorn, prairie dogs, coyotes, porcupines, badgers, elk, white-tail deer, and bighorn sheep. Nearly 200 species of birds can also be found here, like red tail hawks, prairie falcons, mountain bluebirds, yellow headed blackbirds, and the occasional golden eagle. 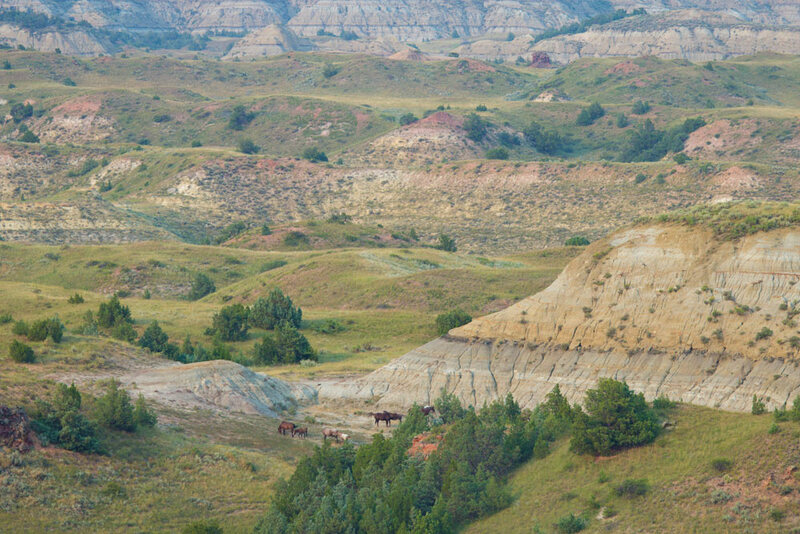 Watching wild mustangs in the badlands of Theodore Roosevelt National Park. Bison can be found along the Little Missouri River corridor and since prairie dogs build their “towns” in the grasslands, these are a great place to also find coyotes and badgers. May and September are the most pleasant months to visit the park. You’ll enjoy great temperatures and find that the park is not too crowded. During summer, elk are more difficult to see as they travel to higher grounds to feed. Insider Tip: Stay at one of the walk-in campsites at the Cottonwood Campground in the South Unit for an incredible Little Missouri River view and have a little privacy from the other campers. Centered on Denali, the tallest mountain in North America, Denali National Park is serviced by a single road. Private vehicles can only drive the first 15 miles of this road. Visitors that wish to go further into the park can take a shuttle bus (only available in summer). 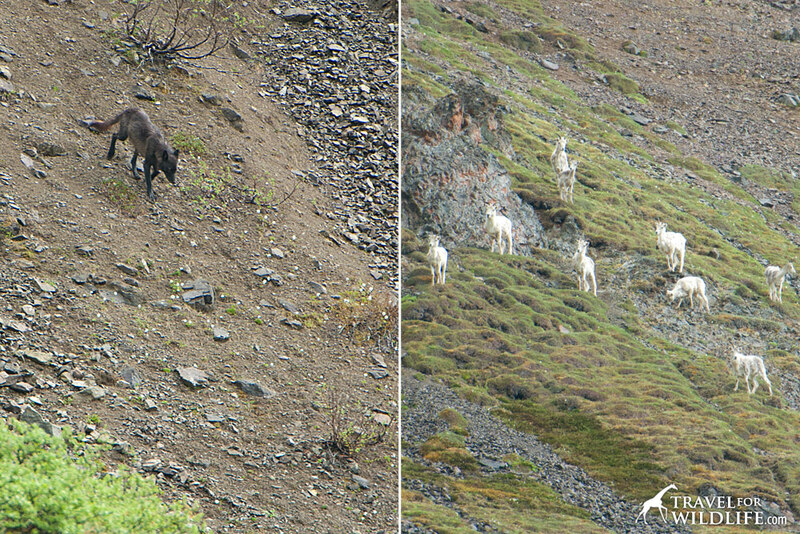 A lone black wolf approaches to investigate a herd of dall sheep. Seen from the shuttle bus in Denali, one of the wilder national parks in the United States. If you’re looking for a true North American wilderness back country camping adventure, Denali is hard to beat. The park is carefully controlled so that each camping party has a large segment of the park all to themselves. 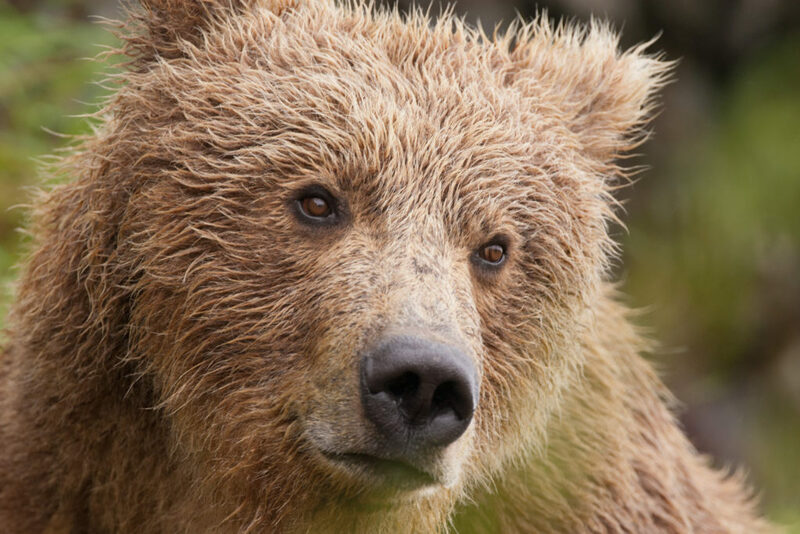 What could be better than private bear, wolf, and caribou sightings in the Alaskan wilderness? Even though the park is open year round, the main season for visitors is May 20th through the second or third week in September. Denali and other peaks of the Alaska Range are covered with glaciers, tundra, and spruce forest. 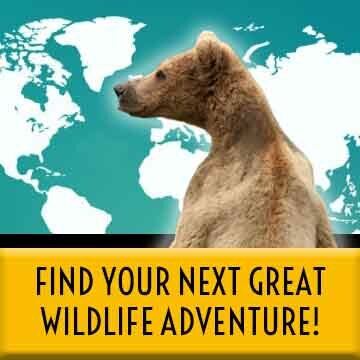 Wildlife includes grizzly bears, Dall sheep, caribou, moose, lynx, porcupine, wolverine, arctic fox, and gray wolves. 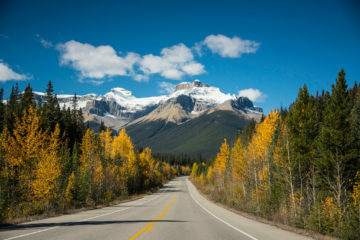 Insider tip: the Road Lottery gives winners the opportunity to drive the road during one day in September. Read more about the lottery here. 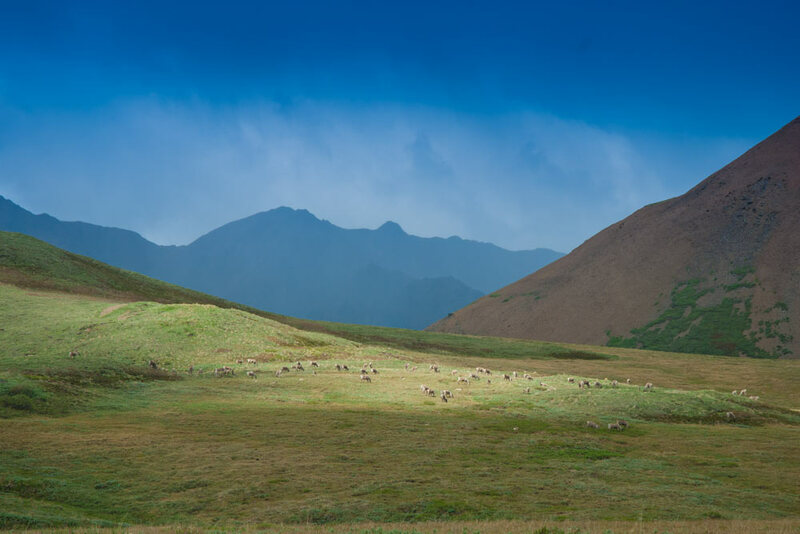 Summer is definitely the best time to visit Denali National Park and see wildlife as the weather is most pleasant, but each season has its own unique beauty and wildlife rhythms. Winter adventurers can still hike and camp in the back country during winter months. 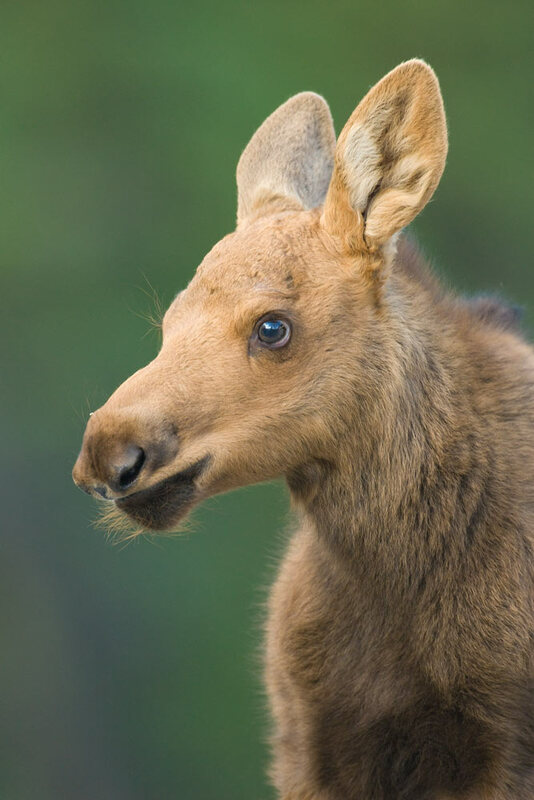 A baby moose in June in Denali National Park, Alaska. Which national park is your favorite to watch wildlife in the U.S. Let us know in the comments! Previous ArticleWhat Do Elephants Eat?